AISnet is a new AIS receiver for use as an AIS base station at home or in the office. 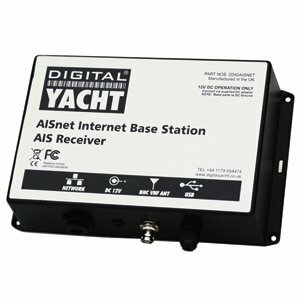 Utilising the same high performance dual channel AIS receiver as the rest of the Digital Yacht range, AISnet also features an ethernet socket so that you can connect it to your broadband router and send AIS data to an on-line AIS tracking service. There are now a large number of internet based web sites which offer a view of AIS equipped vessels on a background chart allowing users to check the position and identity of ships and yachts. If your home/office is close to the coast and you would like to contribute your data to one of these sites, simply register with the company and they will give you an IP address and Port number. Using the setup program that Digital Yacht supply, it takes seconds to program the IP address and Port in to AISnet, which will immediately start sending your local AIS data seamlessly across the internet to be displayed on the site. It is also possible to view the data, that AISnet is collecting, locally on your PC using the free SmarterTrack Lite software that Digital Yacht include with every AISnet. Simply plug the USB connector into your PC and the AIS data will appear on your PC and still be transmitted over the internet. AISnet is supplied with a universal UK/Euro/US mains adaptor that provides a regulated 12v supply from 240v/110v AC mains.